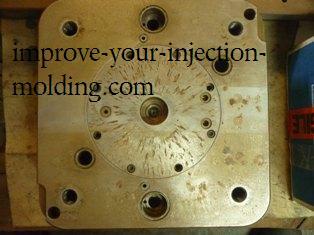 Correct injection mold design is crucial to having a profitable business. A proper design will ensure quality plastic parts will be produced for the intended life of the mould at the expected cycle time. Click here to see our video example of a well designed mould producing food containers at a 4.0 second cycle & to read about our Mold Design Services. Unfortunately, many mold designs have some fundamental flaws which prevent the injection molder from achieving a higher level of productivity. By learning about one of the most common injection mold design mistakes you can avoid waste and help make your company grow and be more profitable. Click here to learn about another common design mistake. 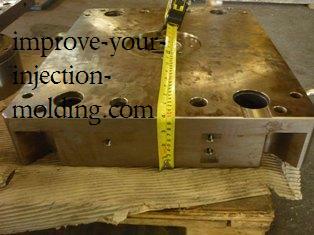 Most molds have 2 back plates with one on the fixed side and one on the moving side. Figure 1 shows the back plates in between the molding machines platens. 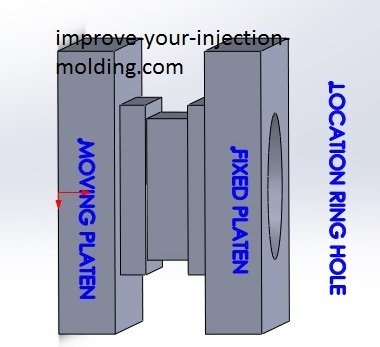 These quality problems occur because the platens do not provide enough support to stabilize the mould against cavity injection pressure and clamp tonnage. What’s more, repetitive deflection causes wear inside the mould. 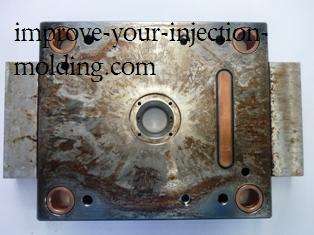 One of the things mould wear does is reduce the effectiveness of the venting. 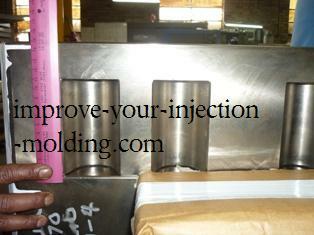 Poor venting will also result in reject parts – especially in multi cavity moulds. It’s important to keep in mind that during the injection molding process most machines will have some amount of platen deflection. Platen deflection is not necessarily a bad thing, however, if the deflection is extreme then part quality will deteriorate over time. This can happen over a period of years, months or weeks depending upon the injection mold design and selection and condition of the moulding machine. Platen deflection is usually worse on the fixed side platen because of the weakness created by the location ring diameter and the larger recess behind it. 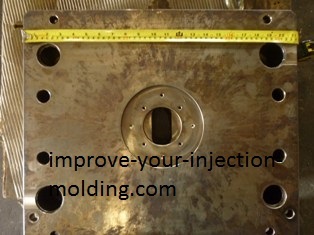 The diameter is quite large in most machines as it is clearance to allow the machine injection unit nozzle to connect to the mould (see figure 1). On top of that, if the fixed half of a mold is a cavity (as opposed to a core) then this adds to the weakness of the system. A cavity is naturally weak because of its shape. The combination of these 2 weaknesses require an extra thick and wider back plate on the fixed side to strengthen a mold. 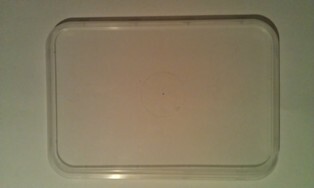 Figure 2 is a rectangular lid made from a 2 cavity mold. The lid started to severely flash after only 8 weeks from mould commissioning. 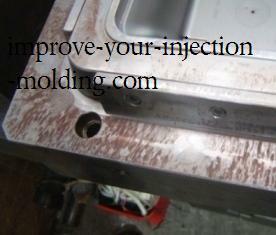 An investigation found that there was too much platen deflection so the fixed side back plate was replaced on the mold. The original plate was 90mm (see figure 5) while the new plate was 150mm. The thicker back plate bought the deflection within a manageable level so that quality problems were eliminated. The main clue to the problem was the pattern of radial brown hard marks found on the back plate – see figure 3. This pattern was a clear indication of too much platen deflection causing the mould to wear on the shut off faces of the cores and cavities resulting in part flash. Figure 4 gives a closer view of the hard marks. Relating part quality problems to excessive platen deflection is not that difficult once you know where to look and what to look for. This type of issue happens in all types of injection moulds from fast cycling thin wall moulds to slow cycling single cavity moulds and the sign is the same for all of them. Look for radial lines of hard marks on back plates and also on shut off surfaces of cores and cavities. Figures 6, 7 and 8 are more examples of the hard mark pattern produced when large platen deflection is present. Figures 9, 10 and 11 show a 4 cavity lid mold designed with an extra thick back plate on the fixed side 150mm thick. 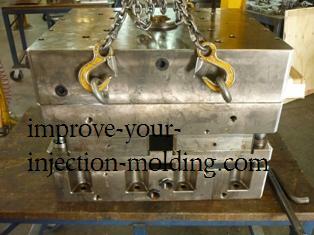 This mould has produced millions of quality parts without any problems. Note the hard mark pattern on the back plate in figure 9, it is completely different to the pattern in the 2 cavity (figure 3). This is how the hard marks on a properly designed mould should be. Click here to learn how to improve mold design using moldmax copper alloys. 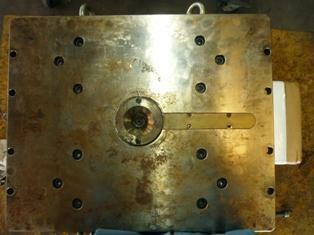 Click here to learn more about another aspect of mold design called 3 plate mold design. Have a Question About Injection Mold Design? Are you having difficulties with mold design? Need help selecting the right steel? Not sure how to design a reliable ejector system? This is the place where you can ask your question about mould design.. Ask a question and get your free 5 page troubleshooting pdf guide to eliminating short shots plus an 8 page pdf guide to eliminating flash. In addition to this, get my mold design checklist which will ensure you will never forget the important aspects of design. The pdf files will be available after submission for immediate download. No email address required. Is there any specific calculation for using a particular size of support pillars and it’s placing? How to improve gas vent for part having mirror face? What do you think of diamond coatings used on molds? Stripper plate ejection: Hydraulic or Pneumatic?